This is my new sketch of one of the hardest things to sketch. I mean the Moon or craters that you can find on the lunar surface. There are dozens of small holes and surface irregularities that we should put on our sketch. Nevertheless I tried to present three craters which are lying close to each other on a piece of paper. 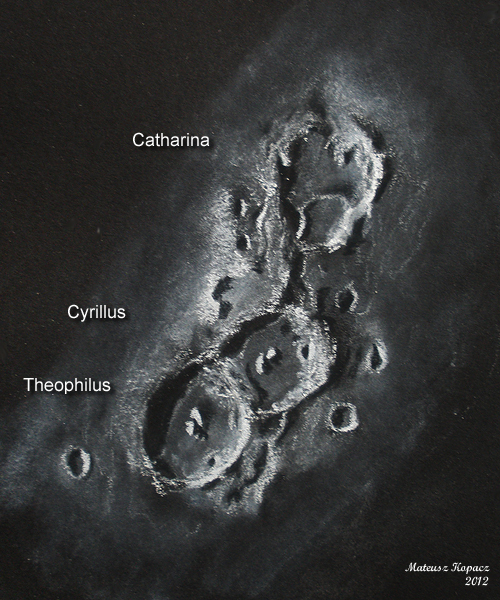 My target were Theophilus, Cyrillus and Catharina. And here is my sketch. This is a fantastic capture of these 3 craters. I really like the way you have handled the bright highlights.